Who wants a forehead that is full of frown lines and angry, droopy creases? A smooth, unwrinkled forehead is the outward sign of a relaxed, youthful person. A forehead lift will easily take away twenty years from your age, making you look refreshed and alert. * It is sadly true that, as we age, wrinkles and frown lines appear on our foreheads. These lines, known as dynamic wrinkles, appear briefly when we frown and immediately disappear in young persons. However, as we age, the skin loses its elasticity so wrinkles start to remain and are visible even when the face is at rest, or in a neutral expression. This means that they are now “static” wrinkles. However, you must note that the aging process will continue, and, as is the case with almost any cosmetic procedure, the improvement in your appearance caused by an eyebrow / forehead lift will not last for ever. If you have realistic expectations, it will result in a more fulfilling experience for you. When you think of going in for any surgery, naturally you have to give it long and careful thought. But, if you have all the facts, you can make an informed decision as to whether this is the correct option for you. Here is the information that will help you decide whether a forehead lift is the right option for you. A forehead lift begins with a visit to the cosmetic surgeon to assess your suitability for the procedure. As is the case for almost any procedure, you should be in fairly good health. You also need to have realistic expectations, as this surgery, though it will surely enhance your looks, will not alter your life! Remember that you will need to have the procedure approved by your primary physician, especially if you are opting for intravenous sedation or general anesthesia. A forehead lift is a safe and fairly routine procedure that will correct sagging of the skin of the forehead, upper eyelids, and eyebrows, thus giving you a smooth and youthful forehead and gracefully positioned eyebrows. A good forehead lift can take years off your age and restore the smooth and unlined appearance of your youth. 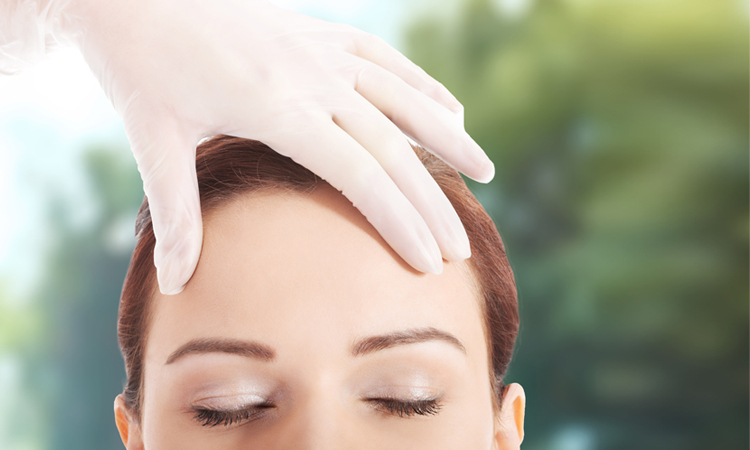 Some surgeons prefer to use the Endoscopic incision method of forehead lift, which involves making a number of small cuts at places on the hair-line. An endoscope (a thin tube with a camera at the end) is inserted through one of the cuts so that the surgeon can determine the muscles which need to be repositioned. This is done with the help of other specialized instruments which are also inserted through the incisions on the hairline. This method usually has a faster recovery time and smaller scars. Your forehead will be bandaged for some time, and your stitches or staples should be removed within a week or two. Your surgeon will give you specific instructions on how to care for the surgical site. Most people can resume day to day activities in about 2 to 3 weeks days. There is always a certain amount of risk involved in a forehead lift, as with any surgery. These risks may include infections, bleeding, scarring, or abnormal eyebrow position. However, it is to be noted these side effects are very rare, and they will normally disappear in a short while. Follow your surgeon’s instructions carefully to see a satisfactory outcome and enjoy your new, fresh and youthful appearance. When you are thinking of undergoing any medical procedure, you will naturally have a lot of questions. Here are the answers to many of the questions that commonly arise in your mind when you are considering having a forehead lift. What Exactly Is a Cosmetic Forehead Lift? In order to undergo a successful procedure you should be in fairly good health. Your physician should give you the go-ahead for the surgery, particularly if you will be undergoing sedation or general anesthesia. You should also have realistic goals – the surgery will improve your appearance but will not impact your life in any other way. What Does a Forehead Lift involve? There are two main methods to consider when you are going in for a brow lift. Your surgeon will assess your suitability for each procedure – and many surgeons have their own preference. Your preference should be taken into account also. A “Coronal” forehead lift involves a larger incision, which stretches from ear to ear, following the hair line. The forehead skin is then lifted and the underlying tissues and muscles adjusted to remove lines and wrinkles. The “endoscopic” method involves a number of small cuts along the hairline; through which an endoscope and various specialized instruments can be inserted to smooth the muscles and tissues and thus remove the wrinkles. The surgery will usually take between two to three hours, and you may be given either local or general anesthesia. You can generally return home on the same day. The wound healing may take about 10 to 14 days. Sutures or stitches will be removed as decided by your surgeon. You should be ready to return to work and normal activity after two to three weeks. Will the scars be visible later? No, the scars should not be visible later as your surgeon will carefully hide the incision lines in your hair line. Are there any risks involved in this surgery? As is the case with any surgical operation, a forehead lift can sometimes result in infection or scarring. Taking proper care of the incision after the surgery can greatly reduce these risks. If the doctor’s instructions are carefully followed, the chances of any complications are almost zero. What after – effects should I expect? After the procedure, be sure that you follow the surgeon’s instructions carefully. Your doctor will prescribe the appropriate pain medication for you. You can expect some discomfort during the period immediately after surgery. But if the pain is very severe or if there are any vision changes, call your doctor immediately. During the recovery period, the entire forehead and eye area will be bruised and swollen, especially for the first few days. However, you should be back to normal within two to three weeks. How much will the treatment cost?”]The cost for this treatment can vary from clinic to clinic and surgeon to surgeon. You should check out various options to get an idea of the cost in your area. You must remember that it is always worthwhile to pay a little more to get the best clinic and best surgeon possible. Before you decide to go in for a forehead lift, it is essential that you visit a reputable clinic and also seek out an experienced and efficient surgeon who is well-versed in carrying out this procedure. The surgeon should ask you for a detailed medical history, and carefully assess your general health. If possible he should also be in touch with your physician, especially if you suffer from any health issues, such as cardiac problems, diabetes or thyroid problems. If you suffer from any of the above conditions, or if you are a smoker, the surgeon will decide whether you are a fit candidate. The surgeon should also determine that you have a realistic goal and are not expecting a drastic life change as a result of your forehead lift. Your doctor should discuss the forehead lift procedure with you and explain the precautions that you need to take before the surgery. You will be instructed to stop taking any medication, such as pain relievers, e.g. aspirin and ibuprofen, that can thin your blood and prevent it from clotting. You will probably need to stop taking these medications one to two weeks beforehand, to avoid any chance of excess bleeding during the procedure. Eat just a light meal the night before your surgery and avoid eating or drinking anything after midnight. On the morning of your surgery, you should take any essential medications that you normally take, e.g. for blood pressure, with just a small sip of water. Do not wear any makeup on the day of surgery. Ensure that someone is available to take you home and care for you for some time after you are released following surgery. For at least two days after the surgery, you should keep your head elevated to help ease the swelling, and you should gently apply ice packs to the affected region. You will probably have swelling and bruising, that can affect even parts of your face that weren’t operated on, including your cheeks and eyes. The swelling should be gone in about a week. Make sure your house is stocked with plenty of gauze, clean towels, and ice for when you get home after your brow lift. If your surgeon used the classic method, you will probably experience more pain during your recovery. Your doctor will give you a painkiller. After the endoscopic procedure, you will also get a prescription painkiller but probably you will experience less pain. In either case, you may also experience numbness or tingling. This will, however, ease after some time. Those who have the classic procedure may have more numbness. The surgeon will tell you when the sutures or staples will be removed. You must avoid vigorous exercise, heavy lifting, or other such activities for at least the first few weeks after surgery. Most people can return to work or school within a fortnight. But, you must call your surgeon immediately in case you have symptoms such as severe pain or swelling, a change in vision, or fever over 100o following your forehead lift. However, these complications occur rarely, especially in the hands of a skilled surgeon, and usually resolve themselves in a short while.